(Resolutions booklet here.) In the director election I recommend voting for three candidates not recommended by the Board. 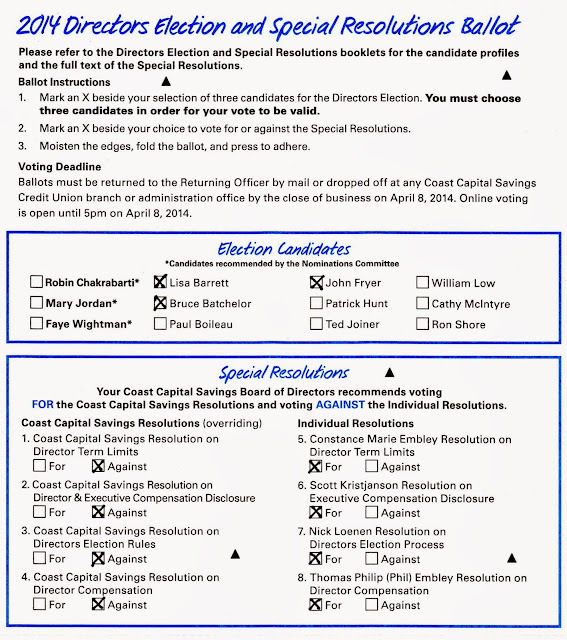 I'm voting for Lisa Barrett, Bruce Batchelor and John Fryer. 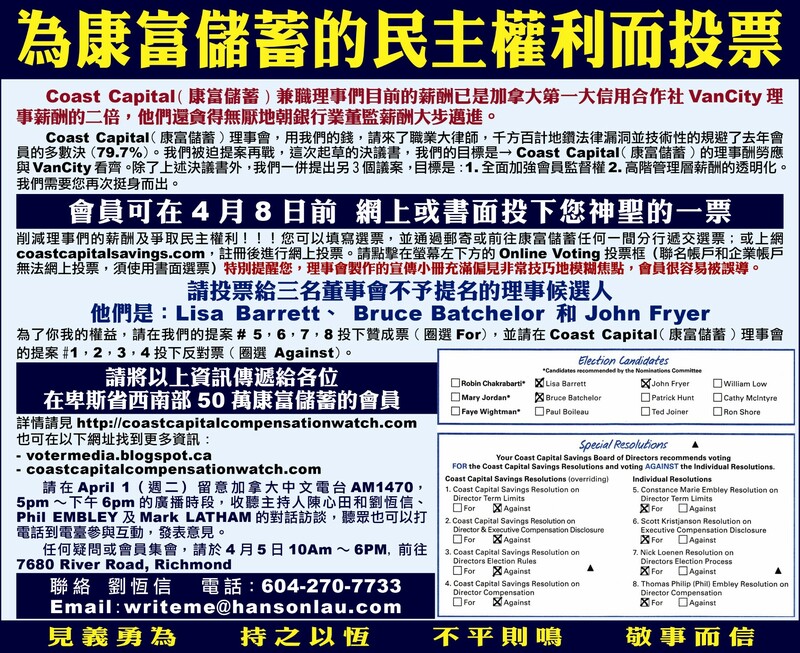 Please spread the word to your friends who may be among Coast Capital's 500,000 members in southwestern British Columbia. 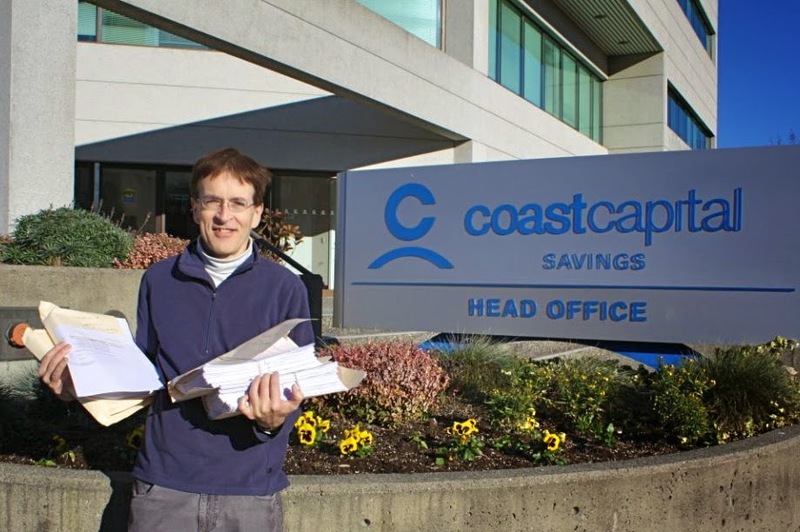 "Be it resolved that, the members of Coast Capital Savings Credit Union establish the remuneration for the Directors of the credit union and that the amount paid to each Director is published in the Annual Report." Page 5: "...you are being asked to vote on a special resolution brought forward by a member named Phil Embley..."
-- No mention of the over 400 members who signed petitions in support of bringing the resolution to members' vote. Page 5: "...every three years the Board Governance Committee works with an independent external compensation consultant who reviews director compensation..."
-- Of course, the "independent" consultant is selected by the Board. Page 8: "Coast Capital advises our members that some of the facts alleged in the [resolution's supporting] statement are inaccurate and misleading." -- They gave no specific backup to this accusation, in spite of the many pages of their arguments in the booklet where they could have done so. Page 9: "Vote “Against” if you agree with the 2007 member-approved approach to establishing director compensation"
Fortunately, members were able to see through the Board's spin, and voted 79.7% in favour of the member resolution! Voter turnout in 2013 set a new record of over 23,000 compared with less than 14,000 in 2012 and less than 20,000 in 2011. Recognizing that excess pay indicated a lack of Board accountability to members, a group of concerned members (including me) worked with Phil and Scott at Compensation Watch to review Coast Capital's governance rules. 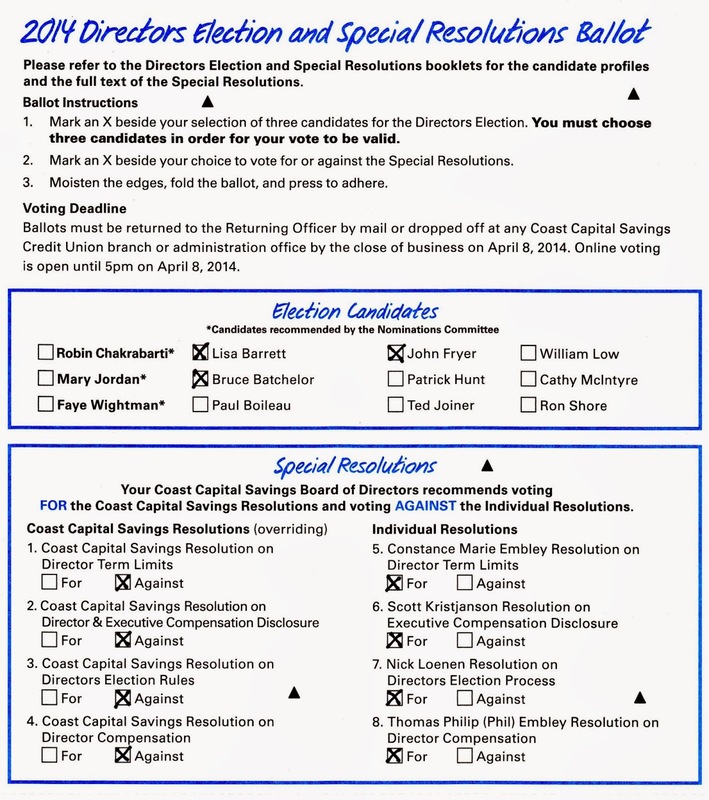 We were dismayed to learn how the Board had written the director election rules to give themselves effective control of who gets elected, while maintaining a facade of democracy: They put their chosen candidates first on the ballot (in bold face, flagged as "recommended"), and prohibit campaigning. Candidates are not allowed to mention their candidacy on the web or by email or in the media, else they will be disqualified -- see 2014 Campaign Regulations (especially rules 4, 5, 6, 7). For data and analysis of how recommendations on a ballot affect elections, see my letter to the B.C. Financial Institutions Commission. Disclose pay of top 3 executives. Set specific pay for directors, at Vancity's pay levels. Several of us also offered to run for election to the Board, even though in 2014 we would still be subject to the ban on campaigning. Page 3: "Four individuals are bringing forward disruptive Special Resolutions ... which will threaten our great products and services." -- All four of our resolutions are already in effect at successful financial institutions. Vancity's pay levels attract well qualified directors, who run for election with campaigning allowed. 12-year term limits are a well accepted practice, as is disclosure of executive pay. Each resolution is well supported by the statements on pages 6, 8, 10 and 12 of the booklet. On the contrary, a lack of accountability can threaten the success of a financial institution, as the 2008 financial crisis showed us, so we should strengthen accountability of Coast Capital's Board to us, the members. Similarly, a "democratic deficit" in the UK Co-operative Group was a causal factor in their 2013 scandal. Page 3: "These individuals are aligned with a small special interest group known as Coast Capital Compensation Watch. Their name is misleading. This group is not the voice of your credit union. It represents the views of only a few supporters – not Coast Capital’s 512,000 members." -- 79.7% of voting members said that last year's Compensation Watch resolution represented their views better than the arguments of a small group known as Coast Capital's Board. That small group seems to have a special interest in increasing its pay and its grip on power. More members voted for the 2013 Comp Watch resolution than ever voted to elect any of the current directors. Page 5: "The Individual Resolutions are unnecessary and costly." -- These resolutions were made necessary by the Board's unreasonable pay increases and unfair election rules. Compare 2011 Vancity Board pay of $366,000 to Coast Capital Board pay of $750,000 and other comparisons here. Also, the resolution proponents have taken care to time their submissions to coincide with director elections, so as not to require a costly extra mailing to all members. Page 7: "We're already implementing term limits this year." -- The Board's Term Limit resolution was drafted after the members' Term Limit resolution, in response to it, so there's no "already" about it. It even refers to the members' resolution, giving itself the power to override if both are passed. How can they even be allowed to put their resolution first on the ballot? And the Board's resolution would ignore the 20-plus years that two directors have already served: "... only an individual’s years of service as a Director of the Credit Union beginning on or after April 30, 2014 will be counted..." (page 16) So those two directors would have served at least 32 years each before their "12 year limit" resolution would term them out! Page 9: "We already do this." -- The members' resolution calls for disclosing the top three executives' pay individually, to the extent permissible by law. Coast Capital is only disclosing the sum of the top nine executives' pay, which hides information by lumping it together, as explained in the supporting statement on page 8 of the booklet. Page 11: "Keep our elections democratic." -- It amazes me that anyone could consider it democratic to silence election candidates and control voter information as tightly as this Board now does -- see 2014 Campaign Regulations (especially rules 4, 5, 6, 7). Even the organizations I criticized in the paper We Want Our Co-ops Back do not silence candidates as Coast Capital does. Page 13: "Your Board also commissioned an independent member task force to review the credit union’s philosophy that sets Director pay." -- The Compensation Task Force process was orchestrated by another "independent" consultant chosen by the Board and Board-overseen staff. It concluded by proposing another pay "philosophy" that would continue to give the Board leeway in setting its own pay -- more on that at this Comp Watch page. - Twitter search "Coast Capital"
Credit union facing another members’ revolt? Voting ended April 8 at 5pm. Thank you for voting and spreading the word about the Coast Capital members' democratic reform movement! Or watch webcast linked here after 4:30pm on April 30. Is it possible for a member to enter the AGM AFTER 5p and participate in affairs? Cutoff time for members to register at the April 30 AGM is 5:15pm. Members who arrive later can still enter the meeting, but won't be registered to vote. Thank you "Julie from Coast" for this info via twitter @Coast_Capital -- tweets here.